The future HMCS Harry DeWolf shortly after being floated up in Bedford Basin on 15 Sep 2018 - under tow to Halifax Shipyard. 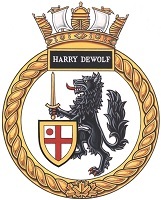 HMCS Harry DeWolf is scheduled to be delivered to the Royal Canadian Navy in summer 2019. Built at Irving Shipyard, she was laid down on 08 Jun 2016 and floated up on 15 Sep 2018. Work continues on her and she is scheduled to be delivered to the RCN in the summer of 2019.